My friend Erin invited me to take part in this month's Halcraft Pretty Palette's Challenge. She sent me a very sparkly, icy inspired collection of beads and told me to create whatever I'd like and I could add in other beads. The inspirations were macro photos of snowflakes from a Russian photographer. You must go visit the Halcraft blog to see their beauties. So I gathered my Humblebeads, took a quick trip to Michael's to round out my color palette with a few more earthy options and set to work. I was a little afraid of all that pastel bling from the challenge, but a great challenge pushes you out of your comfort zone and allows you to put your stamp on it, stretching in the process. 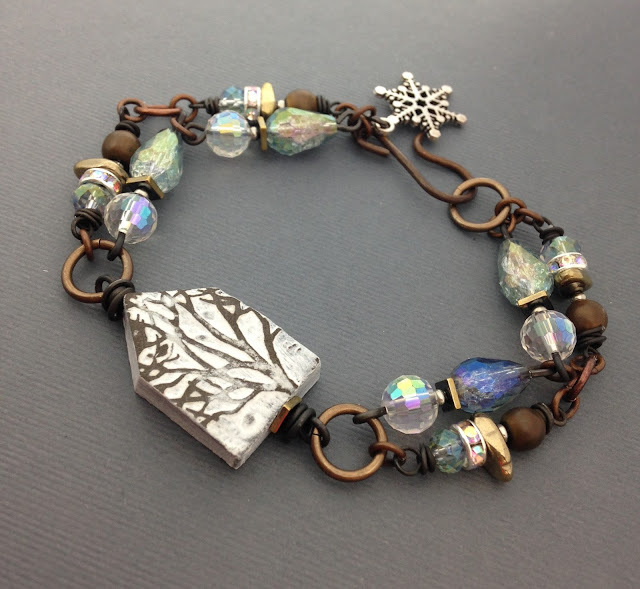 First up is a linked bracelet with a Humblebeads Winter Branches House Beads. I paired together the the snowflake charm, faceted glass and rhinestone beads Erin sent with faceted teardrops and metallic hematite from the Halfcraft Bead Gallery collection. A few copper hematite and copper jump rings added in darker colors to match my focal bead. Snowflake charm earrings with faceted glass and crystals from Halcraft. Erin had sent in a few rose quartz beads inspired by Pantone's color of the year. I wanted to create a piece of jewelry in the pink hues that felt a little like spring might be on the way! I pulled out my Skeleton Leaf pendant, a disk bead and a Wedgwood bead in green from my Humblebeads stash. I paired with up with these unusual shaped sunstone beads that I picked up from a local bead store. My Halcraft beads are tiny dangle accents in between each link. Hurry spring...hurry. I pulled some of the rose quartz colors to create a coordinating pair of earrings using art beads from Green Girl Studios and Gardanne Beads. This was a fun piece, I can't remember the last time I made a charm bracelet. As you'll soon notice, snow owls and woodland inspirations became my underlying theme for the challenge. This bracelet captures it all with art beads from my collection and tiny accents from Halcraft. Snow owl charm earrings with tiny rose quartz crystals and lampwork beads. I wanted to create a multi-strand bracelet that captured those wintry hues and pulled out my Winter Wonderland spacers. 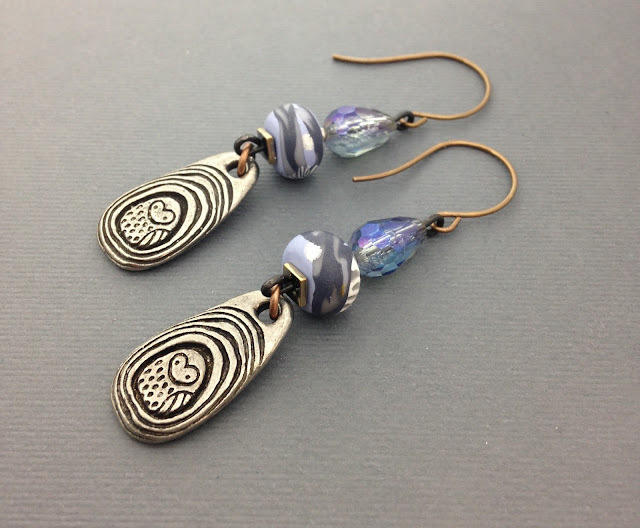 I paired them up with faceted teardrops from the Halcraft Bead Gallery collection, each one on dark annealed steel wire to darkened my color palette. For the multi-strand connectors I pulled out some metal blanks, cut them and hammered them to create a birch bark texture. I love how these turned out and tied the bracelet together. 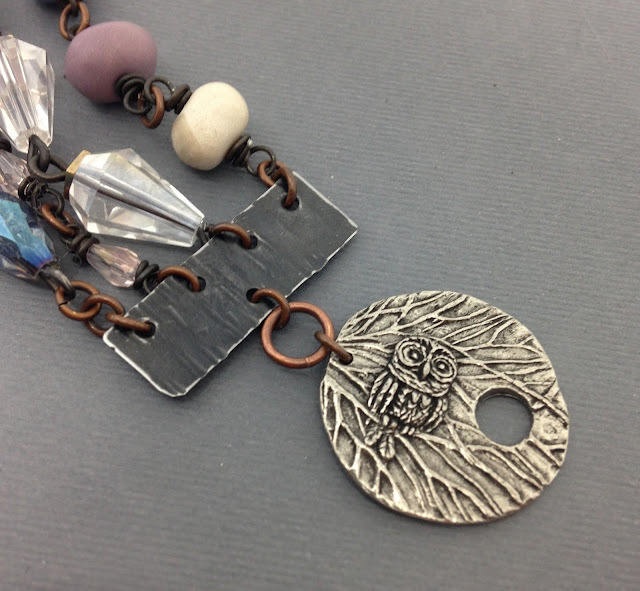 A Green Girl Studios owl clasp finishes the design. 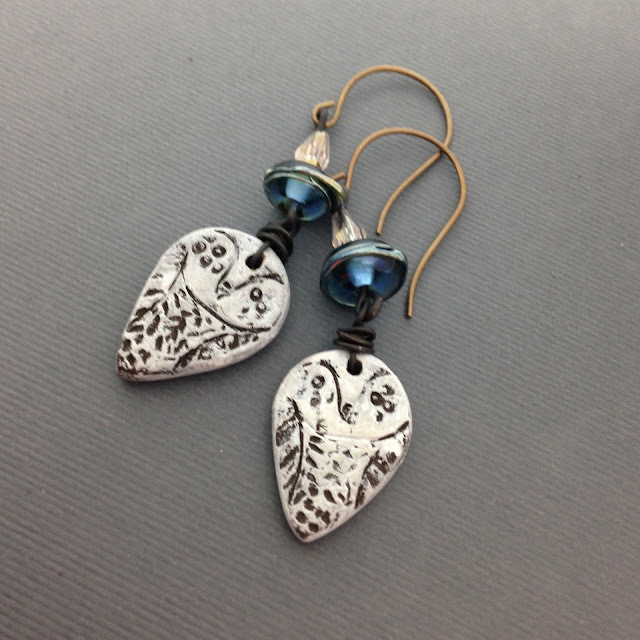 Owl charm earring with Humblebeads disks and Halfcraft faceted glass teardrops. I love a good challenge and Halfcraft certainly provides a lovely one from Erin each month. Please head over to Halcraft blog and see what Erin created, she's kinda amazing you know! 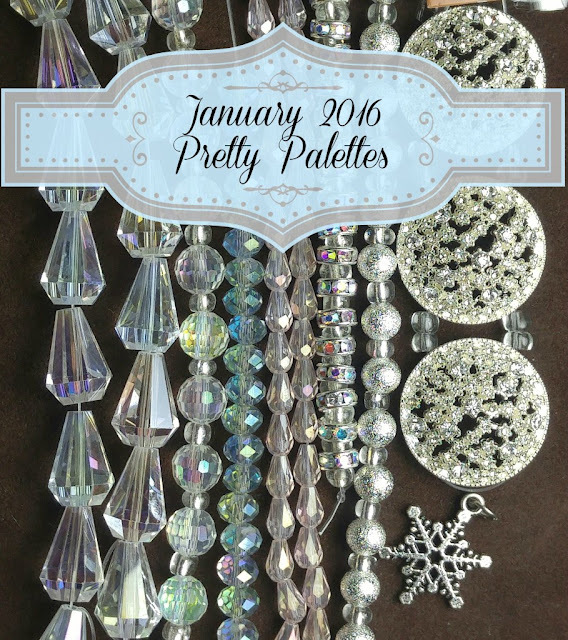 Thank you Erin and Halcraft for the opportunity to showcase art beads for the Pretty Palettes Challenge.